With all that biting cold, winter nights can be quite uncomfortable. This is a time when people start to look for ways to stay warm. Most settle for electric heaters while others opt for thick clothing. However, such methods can be quite energy consuming. Your best friend in such a situation is none other than an electric blanket; a reliable and cheaper option in keeping you warm throughout the night. With it, the days of going to bed wearing a ton of jumpers are long gone. So how do you go about choosing the right electric blanket? Well, you need a blanket that wraps to your size, has extra-warm foot zone and washes easily. You’ll need to also consider the number of heat settings and features that make it easier to use in the dark. Currently, every manufacturer has something good to tell about their blankets. 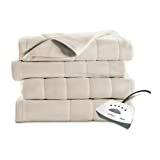 To avoid all the talk and make the right choice, we’ve got something prepared for you; a list of the best electric blankets you can order right now on the market. 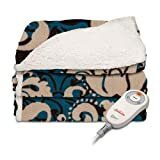 This is an electric throw blanket; one that can be carried and used around the home. The blanket sports an ultra-soft, brushed microfleece construction fabricated from 100% polyester. It reverses to a Sherpa lining that gives you an incredibly cozy feel. The reversible design of this blanket provides ensures you get total comfort. There are 4 heat settings to that let you adjust the temperature to your level of comfort. A 4-hour timer is included for safety, convenience, and power-saving purposes. The blanket is washable and measures 45 x 60 inches. This electric blanket can be used just about anywhere, whether on a couch or in bed. It’s a throw blanket providing the luxurious, soft, and cozy feel of fleece. At 330 GSM, it’s thick yet still manages to stay lightweight for easy storage. The lightweight design of this electric blanket means that it can be used all-year round; in winter or summer. 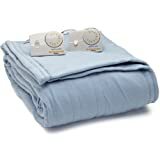 It washes easily in a washing machine and comes in a generous queen size (90 x 90 inches) for maximum coverage. With a GSM rating of 320 and a plushness of 2mm, this electric blanket is sure to give you a comfortable night’s rest. It’s made of fleece; a material that provides lots of warmth and coziness without being too thick. The fleece construction gives the blanket an extra soft feel. 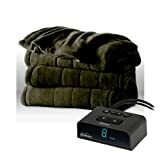 This electric blanket comes with a controller that lets you choose from 10 heat settings. There’s a 10-hour timer that automatically shuts off to save energy. This blanket is available in a twin size. This blanket gives you that extra warmth and does in in a stylish way. The blanket sports a beautiful quilted design for a more classic comfort. It cuts energy costs in a smart way by incorporating a 10-hour auto off feature. You get to set the heat to 5 different levels to achieve a personalized comfort. The blanket is made of fleece; a material you can count on in providing a warm and cozy feel. 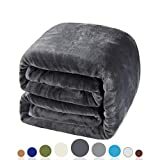 This electric blanket comes in a twin size. 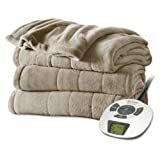 Coming in a king size, this electric blanket is sure to give every inch of your body that needed warmth. The blanket sports the ultra-soft feel of a fleece construction. It makes use of ultra-thin heating wires running parallel to each other to avoid getting entangled. This blanket comes with A dual analogue controller so that each half of the blanket can be controlled independently. Heat is adjustable to 10 different settings and you get a 10-hour auto-shut off feature for extra safety. This is a multi purpose electric throw blanket. It sports a micro-plush fleece construction that provides an ultra-soft feel. There are 3 settings for the heat and you get an auto-shut off adjustable to a maximum of 3 hours. 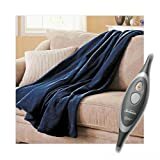 At a size of 50 x 60 inches, this electric blanket is recommended for use on your couch or recliner. The blanket is machine washable for easy care. The unique, micro-plush channeled construction sported in this electric blanket provides a comfort that’s one of a kind. The blanket comes in a twin size and has a multi-set controller to let you adjust the heat. There are 10 heat settings with raised buttons and LED display for easier setting in the dark. The blanket has a Thermo-fine warming system designed to keep the warmth level consistent throughout the night. It comes plush and soft in 100% polyester construction. The low-voltage technology incorporated in this electric blanket makes it a whole lot safer and energy efficient. A microfleece construction provides a luxurious ultra-soft feel. This blanket sports two zones that can be set independent of each other using dual controls. The controls are lighted so you can select your setting with ease in the dark. Ultra-thin heating wires heat evenly to eliminate cold or hot spots. There are a 10-hour timer and a built-in over-temperature feature for maximum user safety. At 400 GSM, this electric blanket lets you enjoy the rich softness of a plush heated blanket. This premium soft blanket comes in a full size that completely wraps you in luxurious warmth. The blanket sports a quilted fleece construction lined with an exclusive wiring system that senses and adjusts to your desired level of comfort. There are 10 heat settings with raised markings for easy use in the dark. This electric blanket comes with a 10-hour auto-shut off feature. This is a lightweight throw blanket designed to keep you warm in your chair or couch. The blanket features a Thermo-fine technology that keeps the heating wires as thin as possible. The heat is distributed evenly to spread the comfort to any target area. Heat is set to 3 different levels and there’s a 3-hour auto off for added safety. This blanket can be wrapped either side, thanks to its reversible design. It measures 50 x 60 inches and can be put in a washing machine.